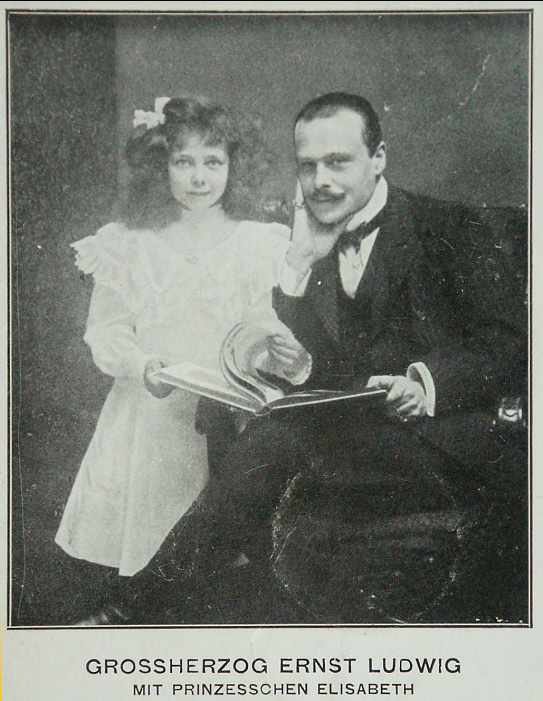 Grand Duke Ernst Ludwig and his daughter Princess Elizabeth. He was a Grandson of Queen Victoria and his sister was Alexandra (Alix) who married Czar Nicholas II of Russia and was murdered along with the whole Romanov family at the hands of the Bolsheviks in 1918. Princess Elizabeth died in 1902. She was seven years old. 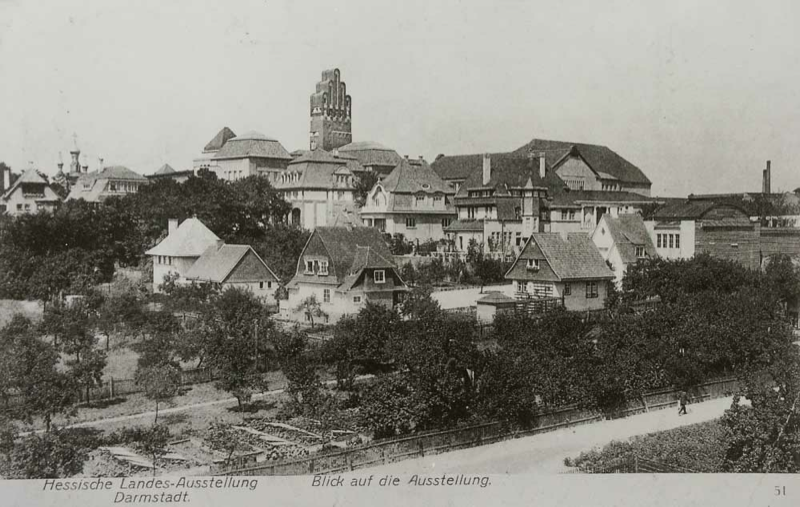 View of the Mathildenhöhe Colony taken in 1908 taken just after the completion of the Wedding Tower. 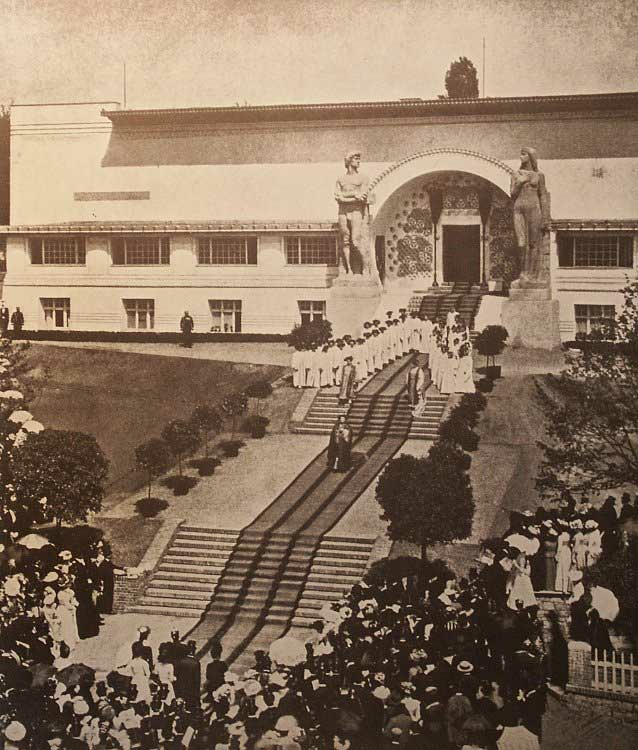 The Festival Performance at the occasion of the First Art Colony Exhibition in May of 1901. In the background is the Ernst Ludwig House which housed the artist's studios. The "Programme Piece" was inspired by Friedrich Nietzche's "Zarathustra" and set to music. The whole event was meant to express, symbolically, a new meaning of life - a new beginning. The performance was heavily ladened with symbolism and mysticism in the Jugendstijl tradition. Crossectional Drawing of the Ernst Ludwig House. 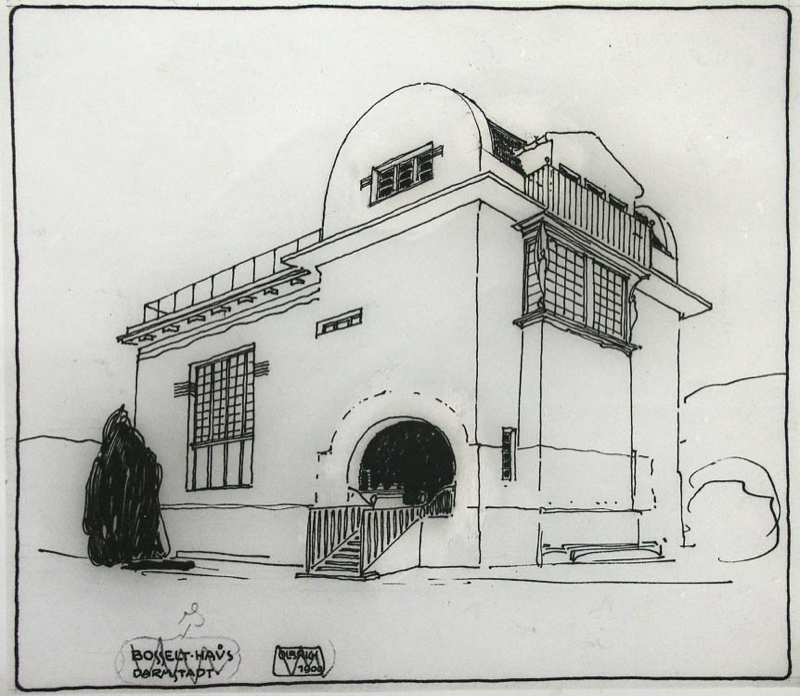 A crosssectional drawing of the Ernst Ludwig House. 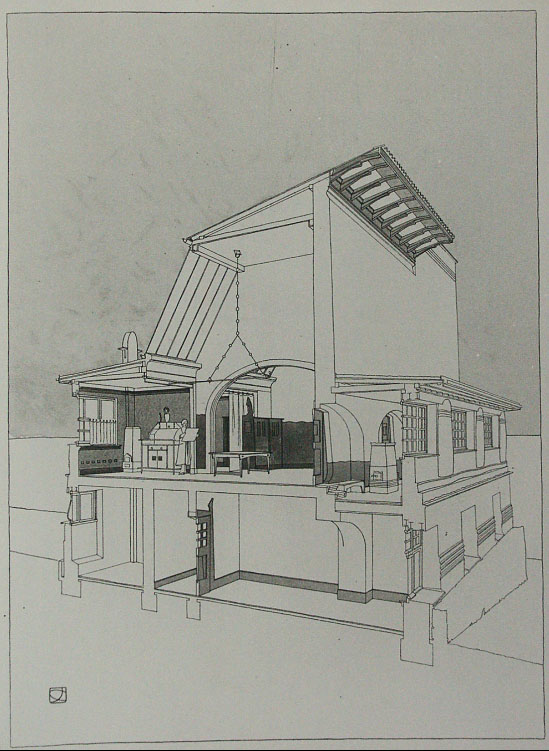 The rear of the structure faced north and was glazed with a curtain of windows that can be seen in the crossectional drawing. This rear elevation was the subject of much derision at the time. 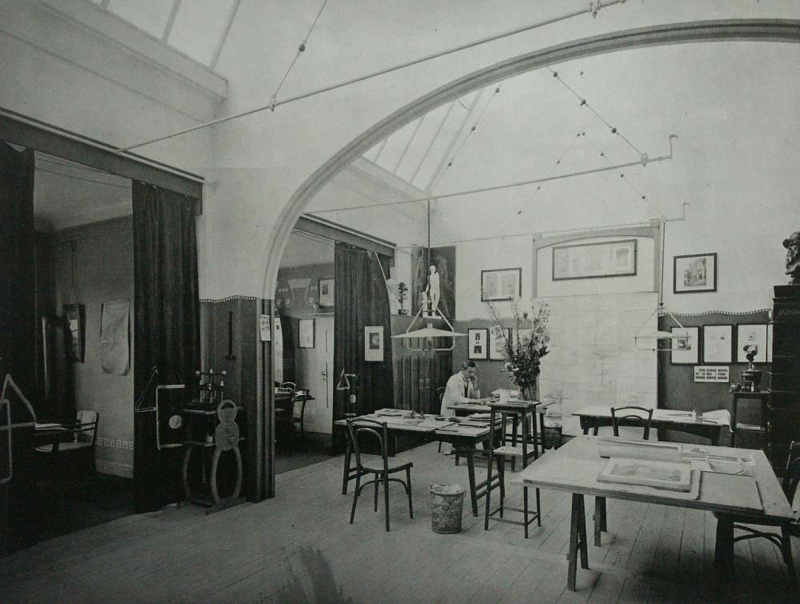 However, aethetics not withstanding, the building functioned beautifully as artist's studios. The "print shop" in the Ernst Ludwig House. 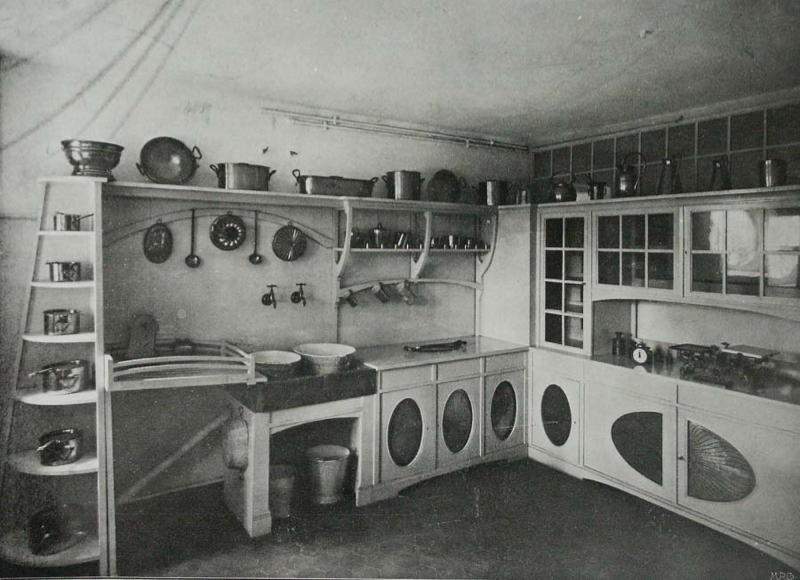 Olbrich designed all of the artist's residences on Mathildenhohe with the exception of the house of Peter Behrens, which Behrens designed and outfitted himself. 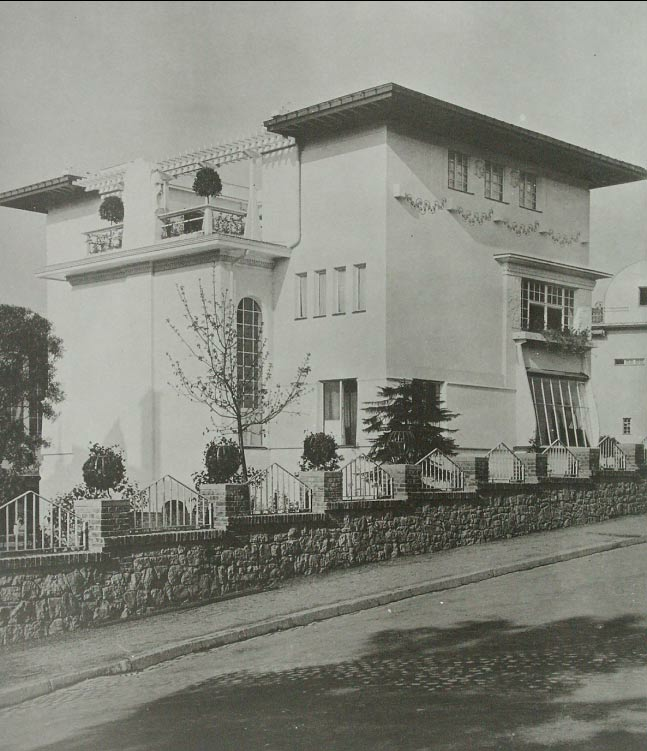 On the "Mathildenhohe Today" page we saw the exterior of the Behrens house (in a contemporary photo). 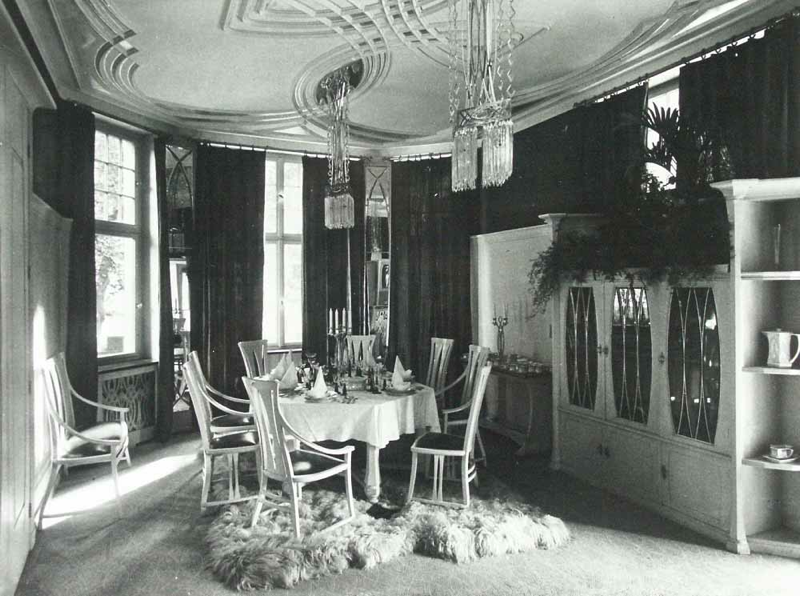 Here we see the dining room circa 1901. 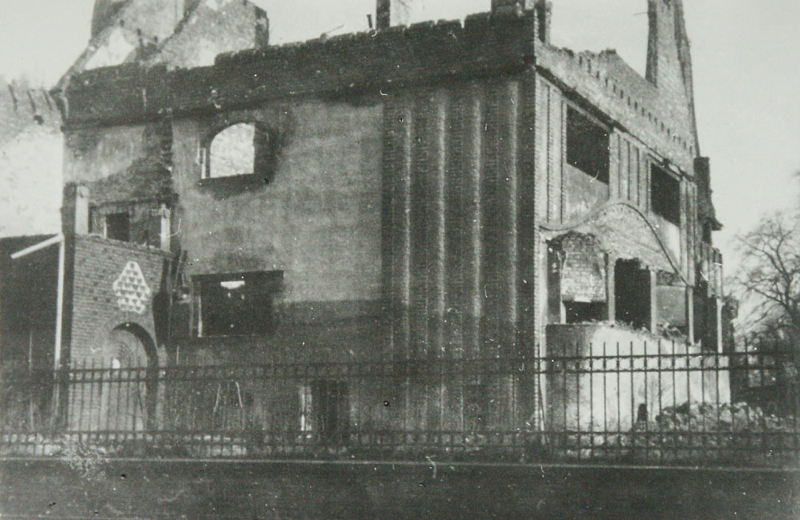 Darmstadt and the Mathildenhöhe were heavily damaged in one night of bombing during World War II. Some rebuilding commenced in the early fifties including the Olbrich House. However, it has been an ongoing effort up to the present time. This image is what is left of the "Three House Group". Originally a group of dwellings that demonstrated living possibilities for the middle class, they were built for the second exhibition of 1904. After the war one was torn down and the other two were rebuilt, albeit with serious modifications to the original design. Vestibule of the Larger Gluckert House, reconstructed in 1967. Julius Gluckert was one of the largest furniture manufactuers in Germany. He was based in Darmstadt and worked very closely with the Colony from it's inception. 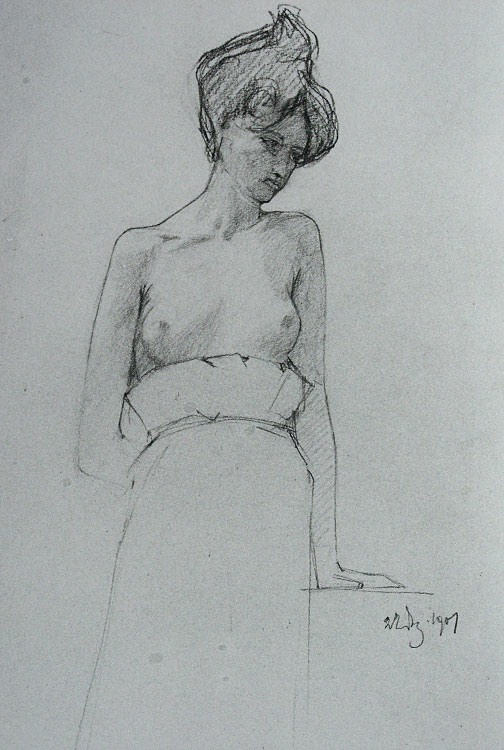 An early drawing by Olbrich which demonstrates his grounding and skill in drawing the figure. Olbrich had always felt that there should be a "crowning tower" on the Mathildenhöhe. 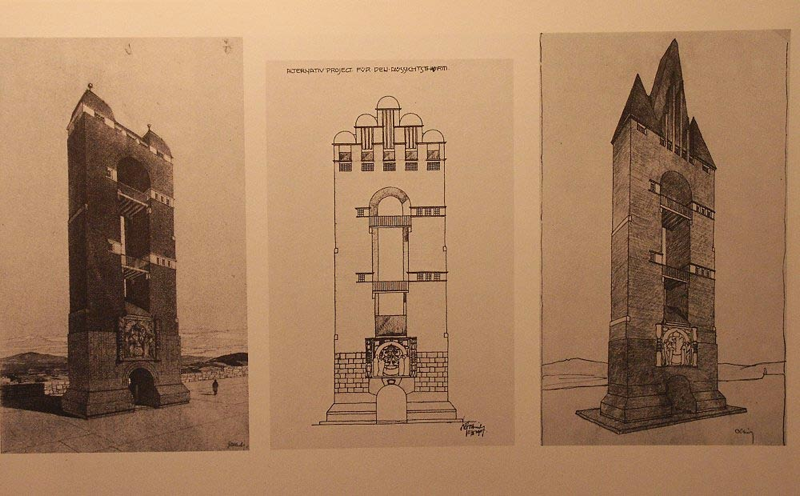 These are several early sketches as he worked through the design process. In 1905 Olbrich got his wish when the city of Darmstadt commissioned him to build the Tower as a symbolic wedding gift to the Grand Duke and his bride. Also damaged very heavily in the war, Olbrich's House is but a slim reminder of once was. The broad horizontal frieze executed in ceramic tile was the strongest visual element in the elevations. The Small Gluckert House. the two Gluckert houses, side by side are in relatively good shape today. 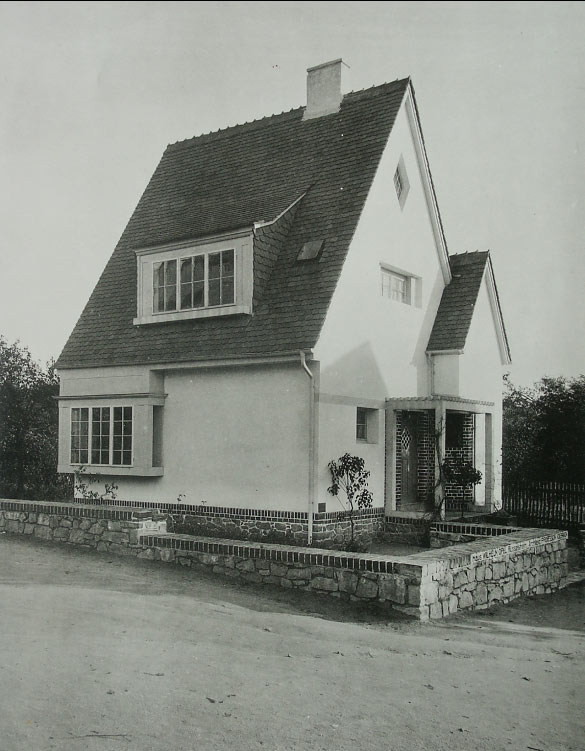 The Small Gluckert House was originally designed for artist Rudolf Bosselt who signed it over to Julius Gluckert before its completion, possibly for financial reasons. Half of the cubic building is crowned by a barrel arch with this shape being repeated in the entrance. 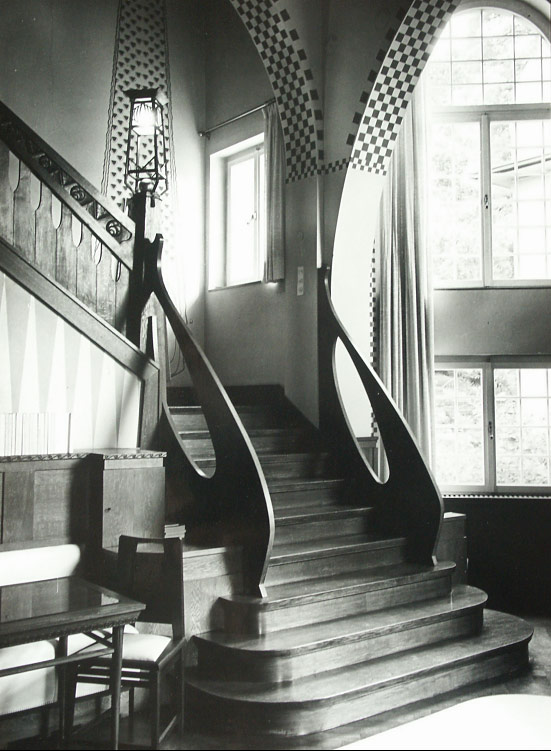 The Ludwig Habich House. Damaged extensively in the war, only the basement and a few floral window lattices remain of the original building. 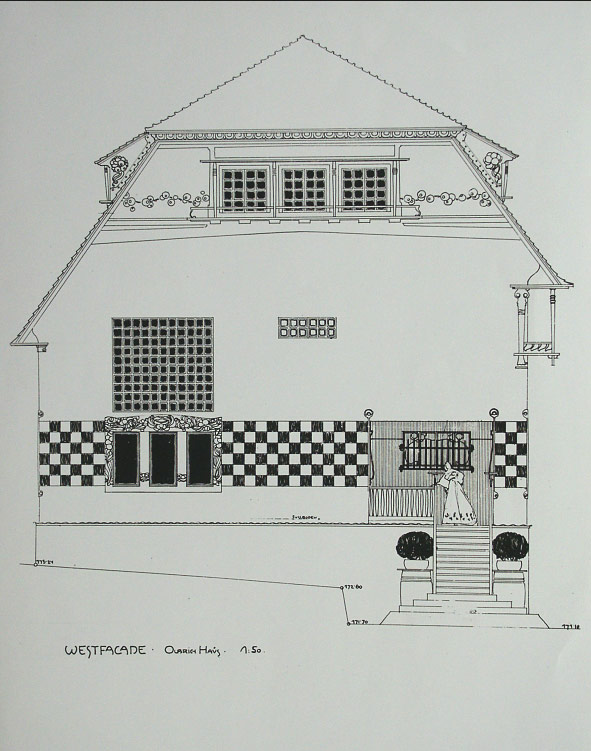 As a part of the 1908 Hessian State Exhibition for Free and Applied Art, was a group of six simple "workers" houses.These were basically composites from plans of several architects, including Olbrich, from the Darmstadt area. They were subsidized by various corporate magnates and were intended as prototypes for inexpensive dwellings. They were built temporarily and removed at the close of the exhibition. 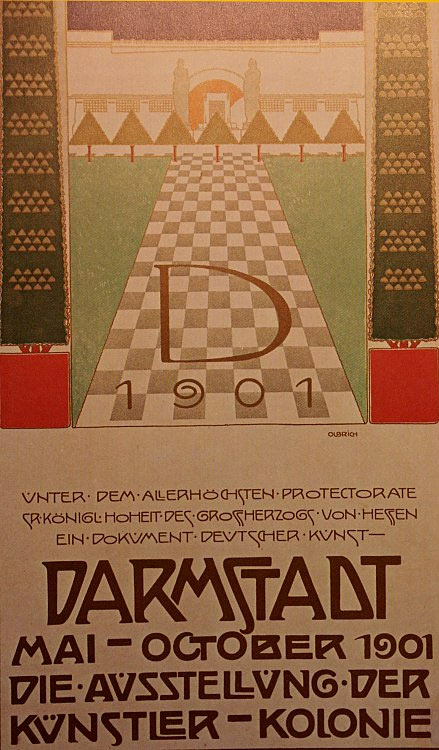 Poster for the 1901 Exhibition designed by Olbrich.